I’m always looking for quick, easy lunches that require few ingredients. Turkey sandwiches tend to get tiring after the 6000th consecutive day. Sweet potatoes are usually my go-to side with any dinner because they’re so easy, pretty healthy, and very delicious. I microwave them (whatever, judge me) because I am not into a veggie that takes longer to cook than a main dish. One day, I had half of a cooked sweet potato left in my fridge. I wanted to use it up but figured it would be kind of a random/bland lunch. I decided to make it loaded! 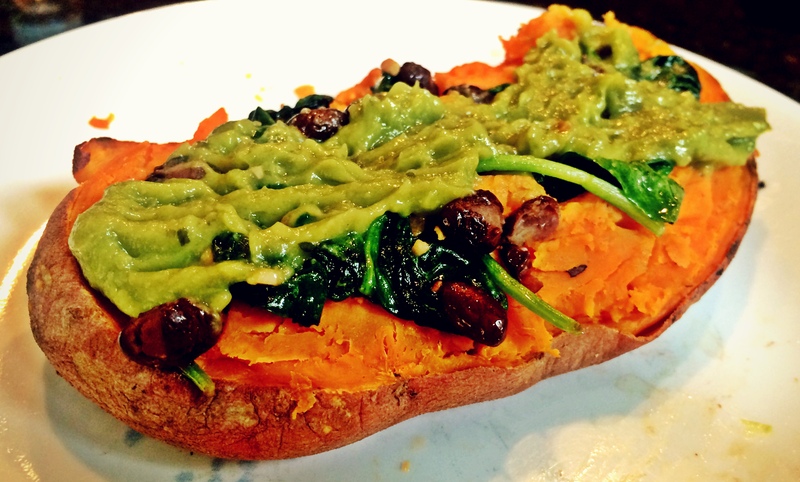 1) Poke some holes in your sweet potato with a fork, then microwave it. Start with 5 minutes and test it as you go. I use that ridiculous potato sleeve (my Nana orders every informercial gadget and regifts many to me) so I don’t even have to flip it over, but I’d suggest flipping it halfway through. If your sweet potato is already cooked like mine was, just give it a quick zap for warmth. 2) Heat a medium saucepan and pour on a teensy bit of olive oil. I was out of kale, so I threw in two handfuls of baby spinach. It may look like a lot for half of a sweet potato, but remember it shrinks down to nothing. Don’t you wish cooking had that effect on you? 3) Forget fresh garlic. Way too high maintenance. I added about a teaspoon of the minced garlic you find in a jar. Mix it up with the spinach and oil. 4) Definitely wasn’t about to add water, cover, uncover, wait for five centuries, etc. So I just stood there for about a minute, mixing my ingredients in the saucepan until it looked cooked enough for my liking. 5) I opened a jar of black beans and drained it the lazy way by just using the top of the can to squeeze out the liquid. I grabbed a large scoop of beans and tossed them into the pan. These don’t really need to be “cooked,” just warmed, so stir them around for 30 seconds or so. 6) Top the sweet potato with the contents of the pan. Kara’s homemade green dressing looked to die for, but I really only die for food that’s cooked for me. So, instead, I squeezed a bit of an individual packet of Wholly Guacamole on top. Classy, I know. Don’t knock it til you try it. Ta-da! Ok, so my sweet potato doesn’t look NEARLY as beautiful as Kara’s, but it was delicious and super filling. The best part is that my cleanup consisted of one little pan! This dish can be used as a lunch, a side for dinner, or even the main dish if you use the entire potato. I’d definitely like to try Kara’s “full out” version when I have a little more time. You can load a sweet potato with pretty much any ingredients you have in your fridge. Don’t be afraid to experiment! Bon appétit, fellow lazy chefs!